Linzer cookies with pecans: The ultimate Christmas cookie. Delicate and delicious, they are major showstoppers for your holiday cookie platters and swaps! These sweet little linzer cookies may just have made me the most proud I’ve been in the kitchen in some time now. When I say that I’ve been wanting to make linzer cookies for the past 7 Christmas seasons, I’m not even kidding you. And with all that waiting came a lot of anticipation and high expectations for what these cookies should be. But they turned out just perfectly and met every one of those expectations! Phew, right?! I mean, they ARE a Martha Stewart recipe, after all! While they look delicate and difficult, they are actually quite easy to put together, though involving a few steps that require some patience, as my cousin and I learned this past weekend while making them. You’ll make the dough and chill it for a few hours. Then roll, cut, bake, and cool completely. In the meantime, you’ll reduce some raspberry jam in a saucepan on the stove. I used seedless raspberry but any kind will work. 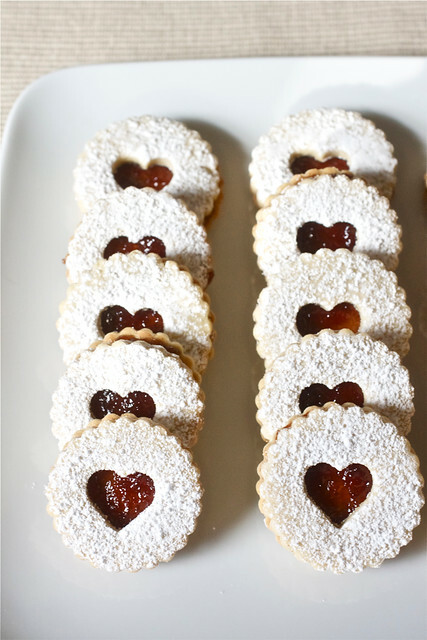 Apricot or fig jam might be really nice in these linzer cookies too! And then you’ve got these picture-perfect Christmas cookies! Like I said, they do require a few steps but they would be the perfect weekend baking project for a few friends or even for your kids or grandkids to help you with. Oh, you want to know about how they taste? Well, think of the best light shortbread you’ve ever eaten, combine it with a tiny dollop of a thickened jam that is almost savory in comparison to the sugared linzer cookies, and you’ve got quite possibly the best Christmas cookie ever. The original recipe has you adding chopped pecans to the dough which sound excellent, doesn’t it! But allergies in our house prevent us from adding nuts to our cookies so I skipped them this time. 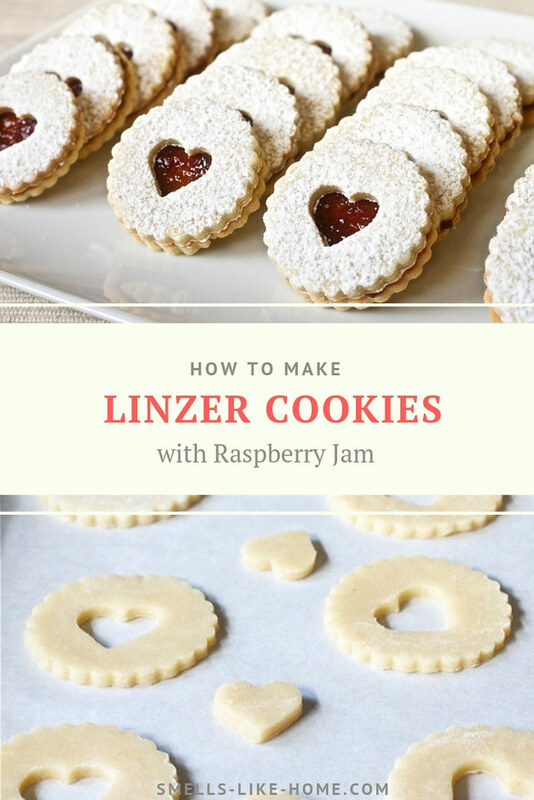 These linzer cookies with raspberry jam just might be the cookies that all Christmas cookies will be judged against – this year and maybe for years to come. That’s quite a cookie! The original recipe (below) calls for chopped pecans to be mixed into the dough but due to allergies, I omitted the pecans. I did not replace them with anything – there were no issues with the recipe this way either – but a ½ cup of coarsely ground oats might be a really nice substitution. Sift flour and baking powder into a bowl; set aside. Pulse pecans (if using), confectioners’ sugar, salt, and cinnamon in a food processor until finely ground (but not wet); transfer to the bowl of an electric mixer fitted with the paddle attachment. Add butter and granulated sugar; mix on medium speed until fluffy. Mix in vanilla and egg. Reduce speed to low. Add flour mixture; mix until combined. Halve dough; shape into disks. Wrap in plastic; refrigerate until firm, at least 2 hours. Preheat oven to 375° F. Line two baking sheets with parchment paper. Working with 1 disk at a time, roll out dough on a lightly floured surface to 1/8 inch thick. Cut out dough with a 2-inch fluted cutter. 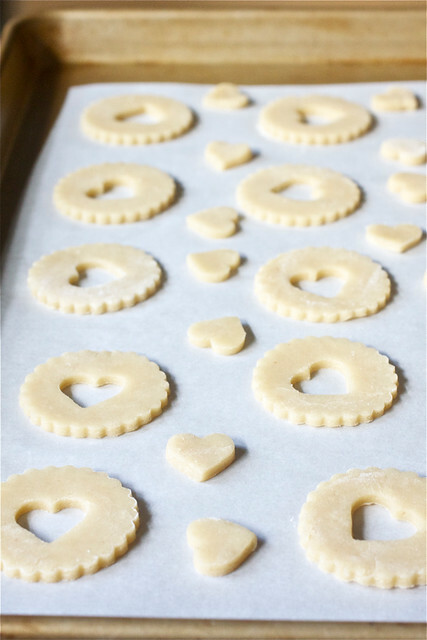 Cut out centers of half the cookies with a ½-inch heart cutter; re-roll scraps. Space 2 inches apart on baking sheets. Chill dough on baking sheets for 5 minutes. 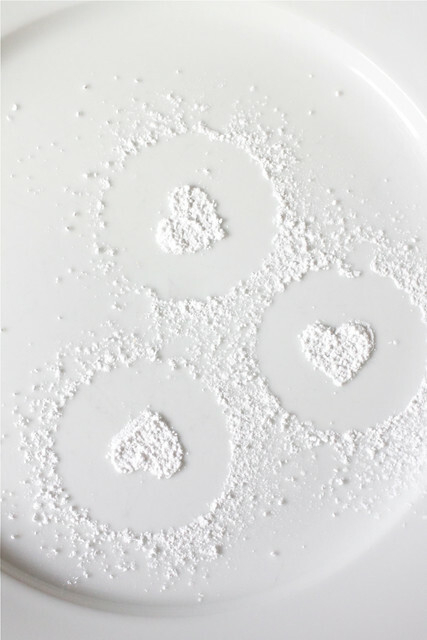 Bake cookies and hearts until pale golden, 8 to 10 minutes, rotating the pans 180° halfway through the baking time. Transfer the pans to wire racks to cool and allow the cookies to cool completely on the pans before transferring to a work surface for the next steps. Meanwhile, heat jam in a small saucepan over medium heat until reduced and thickened, about 7 minutes; let cool. Dust the cutout cookies with confectioners’ sugar – these will be the tops of your cookie sandwiches. Spread jam onto uncut squares; top with cutout ones. Store in an airtight container up to 2 days. Wohh – they look so gorgeous! Such pretty cookies! I totally want to have a cookie party now and try these! These cookies are so stunning!! I am so in love with this cookie. I tried to make them last Xmas and they flopped. The center cut out just melted and was all deformed. I’m going to bookmark you recipe and give it a go again this year. Yours are just perfect. Possibly I needed to chill the cut out dough before putting them into the oven. Snippets: Yes – definitely chill them or even freeze them for a few minutes before baking. It really makes a big difference in how they bake up. The recipe wasn’t written that way though so don’t feel bad – it’s something I’ve learned along the way through trial and error. So pretty! I love the color and how perfect they turned out! 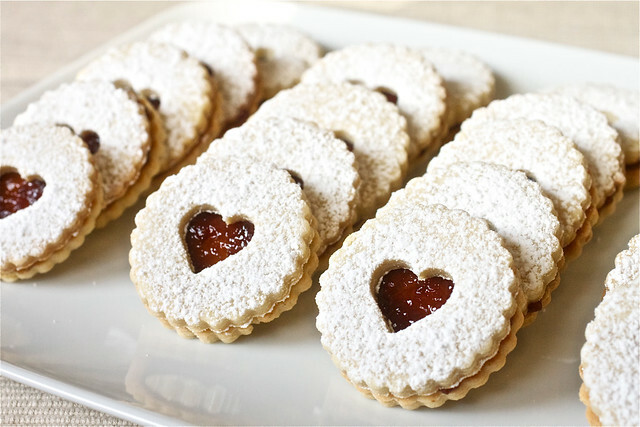 I’ve always wanted to make linzer cookies, but just haven’t before. Maybe this will be the year! They are gorgeous! Love, love your blog! So creative! Mmmm…these look so good & so pretty too. Thanks for sharing, can’t wait to make them. I finally found a linzer cookie cutter(I have looked for one forever) and made them for the first time this Xmas and they are so pretty and taste amazing! One of the prettiest cookies I have ever made! I have been making these every Christmas since I found the recipe featured as a “cookie of the month” in “Living” magazine back in 2007. They are one of my most asked-for cookies. And your’re right….they are not difficult to make. At Christmas, I cut out a start shape instead of the heart. Your cookies look beautiful! When you say you omitted the ground pecans, did you compensate with a little extra flour or anything- I just wondered how much not adding the pecans would affect the liquid-to-dry ratio? Thank you! No, I didn’t add anything else to the dough and didn’t have any issues with a wet dough. These are gorgeous and a cookie that I’ve never made! Thanks to you, I have the perfect recipe! !